Bring a large pot of salted water to a boil. Once the water is at a full boil, turn off the heat. Allow the water to cool, and then add the vinegar. Pickled Cabbage with Beetroot: Remove the outer leaves of the cabbage. Cut the cabbage into quarters, cut out and discard the core from each section, and cut the sections into chunks. Peel and rinse the beetroots and garlic. Cut the beetroots into matchsticks. Place the garlic, bay leaves and black peppercorns in the container that will be used to pickle the cabbage. 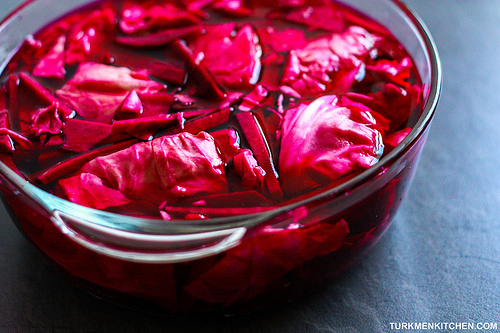 Mix the cabbage and beetroots together with your hands, and transfer them to the container. 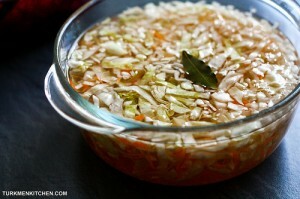 Pickled Cabbage with Carrots: Remove the outer leaves of the cabbage. Cut the cabbage into quarters, cut out and discard the core from each section, and cut the sections into thin strips. Grate the carrots on the large holes of a box grater. Put the grated carrots and cabbage shreds in a container, mix them together with your hands, and distribute the bay leaves over the vegetables. Pour the vinegar mixture over the cabbage. To keep the cabbage from rising to the top, cover it with a plate that is slightly smaller than the container and put a jar filled with water on top of the plate. The cabbage should be 4-5 cm below the waterline. Cover the container with a kitchen towel and store in a cool place. After a week, the cabbage is ready to eat. Remove the jar and plate, and put a lid on the container. 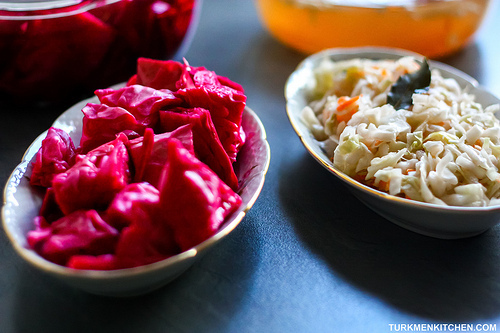 Store your pickled cabbage in a cold place for up to two months.